The Auckland Energy Consumer Trust is currently holding its triennial elections for trustees to look after the community owned shares in Vector electricity. The shares are currently worth in the vicinity of $2.1 billion dollars. There have been rumours of plans by Michelle Boag and others associated with National to try and nationalise and then privatise the shares. Obviously the make up of the trust board is of vital importance in opposing any such move. Historically C&R has dominated these elections. They have been helped by the timing of payments to beneficiaries of the trust which always occurs just before the elections occur. Receiving money for nothing is always a good way to engender popularity although in this case beneficiaries have contributed to their gain through purchasing electricity from Vector. But they use this advantage to the hilt, and as part of their campaigning prominently display the amount of money being paid to each beneficiary. 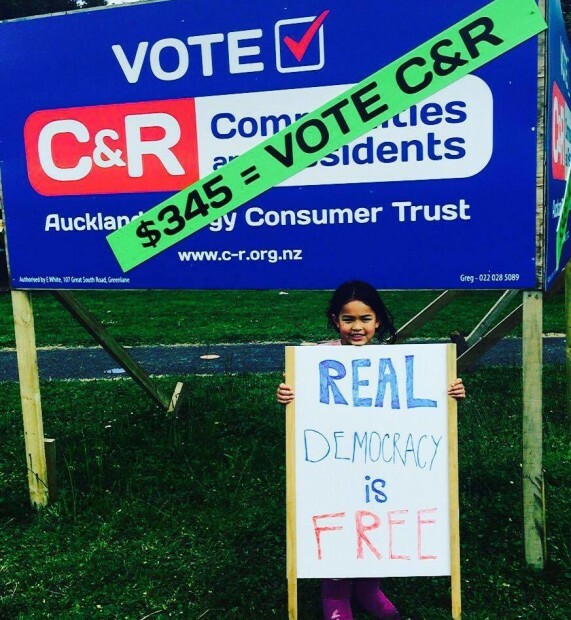 A billboard sign alluding to a $345 payment to voters at the Auckland Energy Consumers Trust elections has drawn a complaint to the electoral officer. The centre-right Communities and Residents team, which holds all five seats on the trust, has put a sign on its billboards that reads ‘$345 = VOTE C&R’. On September 23, the 319,000 beneficiaries of the trust began receiving a $345 dividend from the trust. The trust holds 75.4 per cent of the shares in the energy company Vector that go back to the former Auckland Electric Power Board. It acts in the interests of 319,000 businesses in Auckland, Manukau and parts of Papakura. The sign led to a complaint from a West Auckland woman, Leilani Tamu, to the the electoral officer Dale Ofsoske. Mr Ofsoske told the Herald because the election was being held under the deeds of the trust and not the Local Electoral Act his powers were very limited. Strictly speaking Mr Ofsoske is correct. 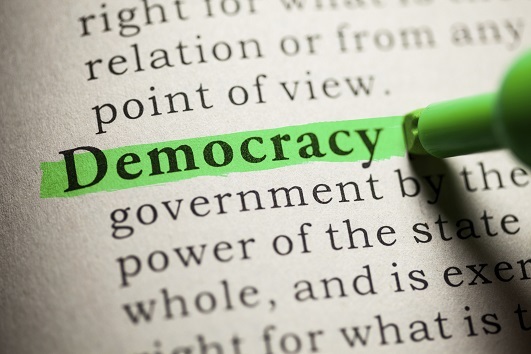 The election is being conducted under the terms of the AECT Trust Deed and not under the Local Electoral Act 2001, otherwise the provisions relating to treating or bribery could conceivably come into play. But you would think that trustees would be more careful in the way that news of the payout was publicised. There are other unsatisfactory features about the election. The Trust’s Annual General Meeting is scheduled for 7pm on Thursday 29 October 2015. The postal election for the Trust closes at 5pm on Friday 30 October some 22 hours later. The prospects of the current trustees being publicly held accountable for their stewardship of the trust appear to be minimal. The election promises to be very close. It is a straight C&R verses City Vision campaign with the interesting addition of ex National Cabinet Minister Paul East to the mix. He is bound to take votes away from C&R. The right’s vaunted discipline has broken down on this occasion and it may be that East’s appearance is a sign that Michelle Boag’s new Future Auckland organisation is starting to flex its muscles. And just a reminder to vote for the City Vision candidates if you are eligible to do so. Having progressive environmentally sympathetic trustees overseeing such a large trust could be very vital, especially if the pressure goes on to privatise the shares. If they win, then C & R may find a number of people asking for the $345 immediately. It does read as though if you vote C and R you get 345. Don’t seem to be any limitations or conditions on it. An additional sticker ‘Trustee fees = $?? ?’ would be helpful to voters. Lets not forget the Rudman’s of this world who want to use Vector’s dividends for funding the nonprofit-industrial complex and middle class hobbies. The good people of Auckland dont seem to realize what a good thing they have. Cool Hoots – so I take it you’re going to bring it up or at least say the exact same thing when you’re on Q&A next time? I wish we had a setup like this in Taranaki. Unfortunately, Simon Moutter, (now CEO of Spark), who was in charge of New Plymouth’s MED and then Taranaki Energy, pushed to have Taranaki Energy merged into Powerco — which then got sold to overseas hedge funds. Oh yes, so much better to fund tax payers money on right wing ‘think tanks’, $1200 a day for Rebstock type consultants, $800k for media watching at MBIE, a fortune of PR people who add no value whatsoever, expensive office fits outs, constant rebranding of government organisations, millions of legal action to protect various legal breaches such as Ports of Auckland, Prof Kelsey etc, sports teams etc. But what do the right wingers always complain about? The arts and things like libraries being such a ‘waste of money’. Some often paltry contribution to the arts that benefit culturally in the community are always cited as the ‘waste’ of money. Some of us left wingers believe millions in lawyers, PR people and Paid for Right Wing ‘consultants’ are actually the waste of money and should be the first to go in budget cuts from councils, government and community funded grants! You may have missed the point that it is a private trust required by law to act in the best interests of its beneficiaries not fund things the trustees of the day happen to have an interest in. It’s not taxpayers or ratepayers money. AECT is a consumer trust, essentially collectively owned. I wouldnt call it “private”. The family trust that you have stuck your mansion in would be regarded as private. Put another sticker on with ‘privatisation party’. The truth needs to be said. I thought their policies were a horror story. Luckily the voters agreed. A relief that the adoption of madness one step at a time can be resisted. Could you have been more wrong here Greg? Here’s a clue – your fantasies are not the same thing as political analysis and commentary. Strange, I know? !